Hello my fellow 7 Quick Takers!! It’s been WAY TOO LONG! October was a crazy month with 31 Days of Europe and then I ended up moving at the end of the month! Talk about INSANE! Hopefully I get back to blogging more regularly. One can only hope! So this set of quick takes I started writing in uh SEPTEMBER and I never finished it but all the links and thoughts are still relevant! YAY! Here we go!! It is now NOVEMBER and Thanksgiving is less than 2 weeks away! How did that happen?!!? Thanksgiving is super late this year and Advent is actually starting very close to December. I always like to do something Advent/Christmas related on my blog and this year I am hosting/organizing an Advent Blog-Hop! I participated in a writing blog-hop a few months ago and it was a lot of fun. I really wanted to do something different on my blog for Advent but I know Advent is a busy time of year so I didn’t want to do something where I had to write everyday (because I did that in October and was burned out). So I took the idea of the writing blog-hop and made it Advent related. This is how it is going to work. I will introduce the blog-hop and all the bloggers on the First Sunday of Advent. Then on your day you post to your own blog and I’ll share on my social media channels who is blogging that day and where to find their posts. Each Sunday of Advent I’ll also post about the upcoming weeks bloggers and topics. I still have spots opened and will would love to have as many bloggers as possible join me. If you’d like to sign up leave a comment or email me at bethannesbest at gmail dot com and I will send you the google spreadsheet I created for you to sign up. If you don’t have a blog and would like to join me you can guest post on my blog with your topic. I was going through the mess that is my email (sadly my email is STILL a mess) and in one of the blogging newsletters I receive I found this editorial template. The blogger uses it for her weekly useletter (which is AWESOME go sign up now!) but I think it can easily be adapted for just regular blogging drafts. I’ve already filled it in with some potential topics! So I am slowly getting through my 30 Before 30 list. I did one that I never thought I’d do…moved out on my own! A girl I met at a bible study had a roommate move out and it was very affordable so I moved in! OMG people on Facebook acted like I moved to Africa…my mom only lives 30 minutes away and I see her at least once a week still. I lived in the dorms when I was in college (5 hours away) so really this is nothing I’m not used to. Besides my moms schedule was so insane I was home alone more than anything anyway and contrary to what all those crazy news articles say I’ve been paying my own bills for years. 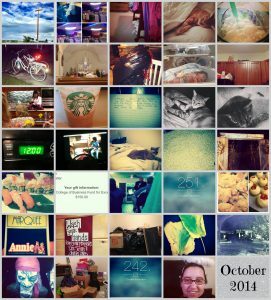 I got SUPER behind on making my monthly Photo 365 collages and finally got caught up and was able to link-up with Jenna’s TL;DR link-up. I can say it’s been a CRAZY year! Also be on the look-out Elizabeth and I are thinking about turning her Weekend in 5 Photos into a link-up! So all your photo takerers watch out! I also guest posted for her this week while she is in Europe! Go checkout my post about not using old cookbooks. A few months ago Jen from the Not Alone Series wrote a blog about “How do you know if you’re ‘in love’?” I really enjoyed reading it and the comments because honestly I’ve always kind of wondered too. As women we’re so emotional so how do you know if the emotions you’re feeling are just happy emotions or “love”? And that made WAY more sense in my head than it does written in words. Since reading that post I came across the same question on a Q&A Site called Quora. My favorite answer to the question was, “When all the songs start to make sense.” It still makes me laugh and I imagine is kind of true 🙂 For those of you in love is that true?!!? Domain Names are really intriguing to me. I used to own a lot more than I do now. I’ve recently thought about buying my full name as a domain as a central hub/online resume for job/freelance prospects but my name is so hard to spell I haven’t taken the plunge yet. But I’m sure I will eventually. I recently came across this article about the MOST EXPENSIVE Domain names in the world. I found it really interesting how much different ones are worth…especially since I haven’t paid more than $20 for any of the ones I own. Warning: not all the domains on that link are kid friendly. Milo has a cat blogging friend Pooh. 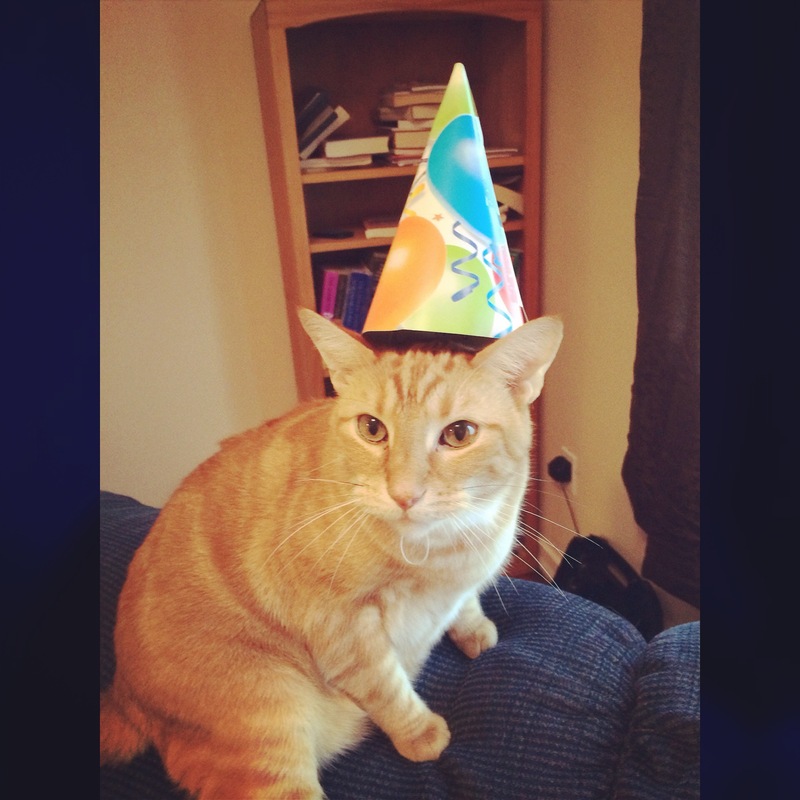 Pooh went to a birthday party a few weeks ago and got to wear a birthday hat. He gave away some birthday hats on his blog and Milo was one of the lucky winners! Have a great weekend everyone! Kelly is guest hosting Quick Takes this week! Thanks for the shout 🙂 Have a great weekend!